Their remoteness has always been a draw: the feminine outlines or brutal ridges, the ruins of summer sheilings on lower slopes, the heather in autumn and the beauty of winter snow can’t fail to inspire, but this summer they’ve somehow filled all the space in my head and called me in the way the Camino de Santiago did last year. I go to bed with a bundle of maps then pore over routes on the internet. My dreams are full of the tops I’ve climbed or the views of other hills I’ve seen from summits during the day. I check mountain forecasts and have my car permanently packed with camping gear in readiness for a rapid escape. Heaving my body up more than 3000ft in the space of a few hours isn’t a pretty sight: there’s the red face, the sweat, endless glugging of water from hill streams, stops to catch my breath and internal debate about why the Hell I’m doing it. For pleasure? Really? 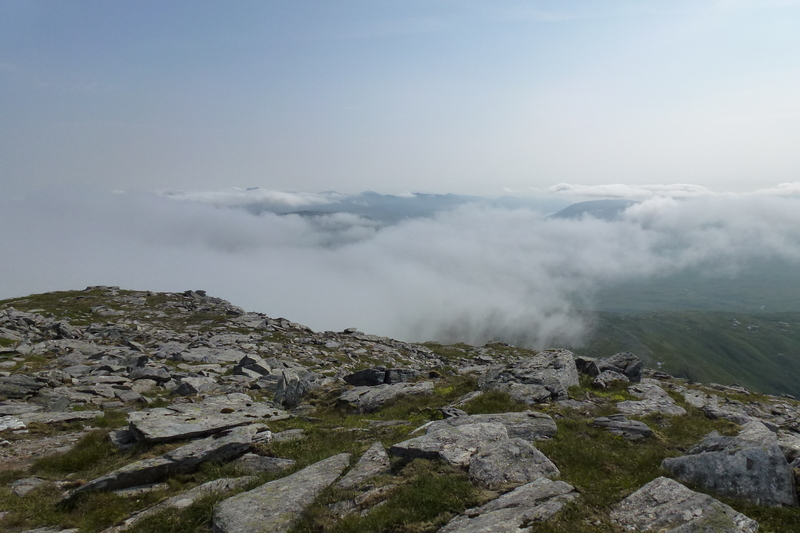 But then when the view opens up below and there are just a few feet to go to the cairn on the top the pain is forgotten. Yesterday, after resisting temptation for months, I bought the Scottish hillwalkers Bible: The Munros. 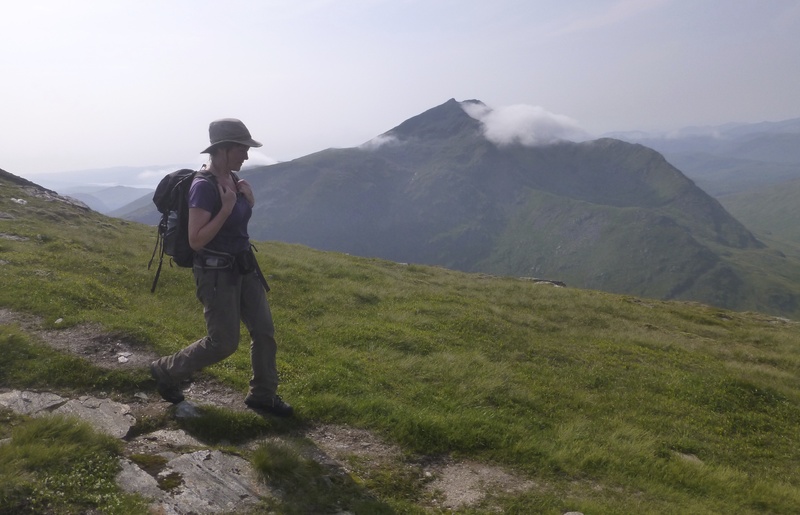 It was my consolation for being back in the city after two days when I camped near Tyndrum and climbed Beinn Dubhchraig and Beinn Oss, two lumps of hill which were shrouded in mist in the morning but cleared to spectacular sunshine just as we reached the second summit. 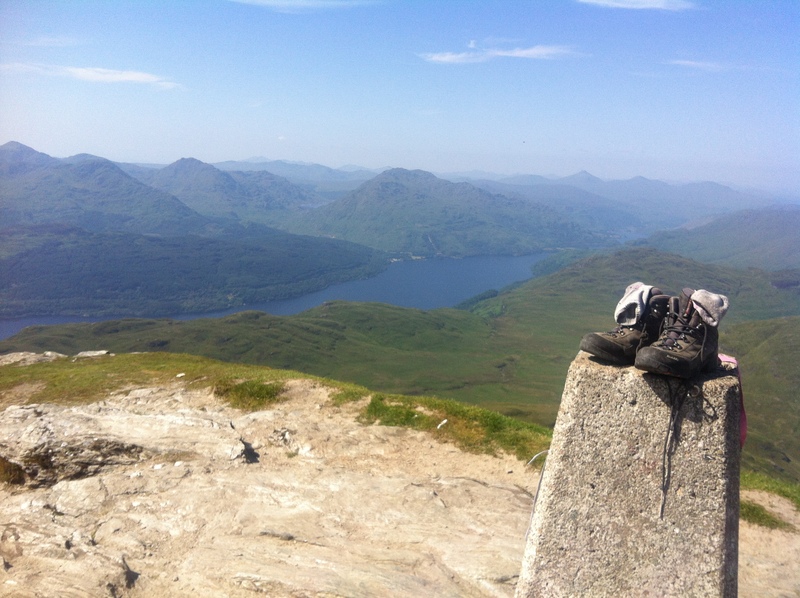 A few days earlier I’d climbed Ben Lomond and the weekend before it was Ben Lawers and Beinn Ghlas. Before they were all just names: iconic views from below or pictures on calendars and in coffee table books. Now I can stare up and remember: I’ve been there and it was so much more beautiful from above. It might be a temporary phase, a passing passion. But “The Book” is open beside me and my socks are almost dry on the line. Beautiful post! What a hike!